Chocolate, in moderation, may improve our cardiovascular health and favorably change the levels of cholesterol in the blood. But what do the studies on chocolate, cholesterol and heart disease actually show? How much chocolate is good for cholesterol? and what kinds of chocolate are good? Why is the saturated fat in chocolate good for us, when saturated fat normally worsens cholesterol? The following article summarizes the work done to date on the study of chocolate and cholesterol. Everyone expected chocolate to be another dietary evil for cholesterol. That is because chocolate contains a high concentration of saturated fatty acids. Years of research has demonstrated quite convincingly that saturated fats are not healthy for the cardiovascular system. Eating saturated fats has been linked to increases in LDL or bad cholesterol, for example. In the mid-1990s when the first studies were done looking at the effect of chocolate and cholesterol, nutritionists had their “Bad For You” stamp inked and ready to go. Chocolate would not receive that stamp, however. It turned out that, at worst, chocolate was no worse for a person’s cholesterol than another high carbohydrate snack. At best, chocolate seemed like it may even be beneficial—but the jury would be out on that until recently. Low fat chocolate isn't likely good for your cholesterol and heart! Could chocolate help our health more than by helping our cholesterol levels? Which chocolate is best for cholesterol and preventing heart disease? Can too much chocolate be bad for us? In the mid-90s, researchers had to figure out why a food loaded with a saturated fat, namely stearic acid, would not lead to unhealthy changes in blood cholesterol, like other saturated fats are well known to do. To understand what they found, it is first necessary to know what a saturated fatty acid is, or a fat, for that matter. First of all fat is oil and oil is fat. The only difference is that fat is a solid at room temperature while oil is a liquid. The two things are also similar at the molecular level. Fatty acids are long chains of carbon atoms and hydrogen atoms with a carboxylic acid at the end. The number of carbons and hydrogens in the fatty acid dictates many of its properties, from its taste to how well it dissolves in water to whether it is a solid or a liquid. If all of the carbon atoms are joined by single bonds, such as in stearic and myristic acids, it is a saturated fatty acid. If there is one double bond in the molecule, it is a monounsaturated fat and if there are two or more double bonds, like in linoleic acid, it is a polyunsaturated fat. In general, mono and polyunsaturated fatty acids (or simply fats and oils) are much healthier for the body than saturated fats. Saturated fats, almost as a rule, raise the bad cholesterol and sometimes lower the good. A fatty acid with 18 carbon atoms breaks the rules, apparently. Stearic acid, a saturated fat with 18 carbon atoms, has been shown to lower total plasma cholesterol and LDL cholesterol. 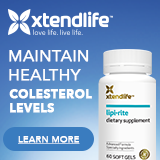 It also lowers good cholesterol (HDL) slightly. While polyunsaturated fats are normally good for blood cholesterol, linoleic acid, a fatty acid with 18 carbons is not. Linoleic is a polyunsaturated fat that increases bad cholesterol! So when you cook, make sure that if you use a polyunsaturated acid that it is not loaded with linoleic acid. Therefore the unique metabolism of the 18 carbon fatty acid, stearic acid, underlies some of the health benefits of chocolate since chocolate is loaded with saturated 18 carbon fatty acids aka stearic acid. In the diagram above, you can see the molecular arrangement of the chocolate fatty acid - stearic acid, in comparison to some others. The strong association between fat intake and blood cholesterol levels prompted many people to eliminate high fat foods from their diet in favor of low fat or reduced fat snacks. Therefore food manufacturers clamored to produce low fat snacks of every shape in size. Soon every fatty food that people once loved had a low fat or non-fat alternative. In order to make these low fat snacks more palatable, food chemists often replaced the fat with large quantities of sugar. This substitution is not necessarily heart healthy however. When a milk chocolate bar was compared to a high calorie snack in a clinical trial, the chocolate bar did not adversely affect cholesterol levels in the blood, presumably because of the stearic acid component of the chocolate. When the researchers measured blood cholesterol levels after each type of snack, there was no detriment caused by the chocolate snack compared to the high carbohydrate one. In fact, chocolate seemed to help. Based on these results, the authors suggest that even foods with relatively high fat content can be included in a heart healthy diet, depending on the composition of fatty acids in the foods. Apparently chocolate has the right combination of fatty acids in it. In other words, if you need an afternoon pick-me-up, a bit of chocolate does not negatively impact blood cholesterol levels, certainly not when compared to a high carbohydrate alternative. Intrigued by its effect on blood cholesterol, researchers attempted to determine if there were any other health benefits of chocolate. The cocoa bean, from which real chocolate is derived, is a natural product and therefore contains many chemicals that can interact with the human body. For example, chocolate contains caffeine and we all know what caffeine does to the body. It turns out that chocolate also has little miracle compounds called antioxidants. The blood is a war zone of sorts. Much of what we eat ends up in the bloodstream and certain things can injure the blood vessels. One way that the blood vessels are injured is through the action of oxidants sometimes called reactive oxygen species. In fact, atherosclerosis involves various pathways of oxidative damage. Antioxidants, on the other hand, are the heroes of the blood vessel war. They neutralize chemicals that would otherwise harm the blood vessels. The main antioxidants in chocolate are polyphenols which are similar to the antioxidants found in green or black tea. These plant polyphenols can neutralize reactive oxygen species such as superoxide. About three ounces of pure dark chocolate contains the same amount of polyphenols as one cup of black or green tea. Moreover, the beneficial effect of cocoa on LDL oxidation is roughly equal to that of red wine and tea. Therefore, chocolate has other beneficial effects on blood vessel health than simply its ability to improve levels of plasma cholesterol. The darker or more native the chocolate, the higher the amount of polyphenols that they contain. For comparison, dark chocolate has about two and a half times, and cocoa has about five times, the amount of antioxidants as milk chocolate. Other compounds found in dark chocolate promote heart and cardiovascular health as well. Plant sterols, compounds found in vegetable oils, cereals, fruits and vegetables, can help lower blood levels of cholesterol. In fact, many commercially available foods are being enriched with plant sterols to improve their ability to lower LDL cholesterol. Chocolate is one of the foods that contain plant sterols naturally. Flavinoids have also been shown to reduce the risk of cardiovascular disease. Cocao (the seeds from the cocao tree are used to make cocoa) is particularly rich in flavinoid compounds such as epicatechin and procyanidins. In general the higher amount of cacoa contained in a foodstuff, the higher the level of heart healthy flavinols. When it comes to chocolate and antioxidants: the darker a chocolate, the better it is for you. The relative amounts of antioxidants are responsible, at least in part, for the recent surge in dark and ultra-dark chocolates available on the market. Manufacturers now offer a wide variety of chocolate choices with varying percentages of cacao. Candy makers are printing the percentage of cacao right on the front of the package. It is true that with any food, the amount of beneficial cocoa flavinoids increases as the amount of naturally occurring cacao increases. The important distinction is that it is unmodified and natural. While milk chocolate is creamy, sweet, and unmistakably delicious, as the cacao concentration increases, the bitterness of the food increases as well. This is why many people prefer lighter chocolate to darker varieties. Manufacturers release different candy bars with differing amounts of cacao in large part to determine how bitter consumers can tolerate their chocolate. The darker the chocolate, the more bitter and better it is (for you and your cholesterol). Unfortunately, consumers do not generally tolerate that much darkness (cacao) in their chocolate. This sad fact has prompted many manufacturers to fiddle with the formula. The process of “dutching” that is, processing the chocolate with an alkaline material, makes it much more palatable, but significantly reduces the level of heart healthy flavinols, and may decrease the cholesterol lowering benefit as well. Thus a chocolate product can boldly put the percentage of cacao on their packaging, but if they “dutch” or treat the chocolate with a base, the health benefits drop considerably. Currently it is quite difficult to determine if a chocolate has been processed in this or other ways from the packaging alone. The percentage of cacao printed on the package is only useful if the cacao is relatively unprocessed. Recent work has also demonstrated that cocoa can reduce the rate of cardiovascular disease and stroke as well as some types of cancer. Sounds almost too good to be true, but dozens of clinical trials have shown the same effects. A short list is included with this article. How can chocolate do all of these amazing things? Cocoa can lower both daytime and nighttime blood pressure. While atherosclerosis tends to make the arteries stiffer, chocolate improves the way in which arteries relax, thus making them less stiff. Atherosclerotic plaques are a diseased spot on arteries, a place of blood vessel inflammation, oxidative damage, and increased clotting. Dark chocolate can reduce blood vessel inflammation and reduce how platelets (clotting particles) collect on diseased areas of blood vessel. It seems that chocolate, apart from its affects on blood cholesterol, may improve blood vessel health and function. If that was not enough, chocolate may not only be safe in diabetes, but even helpful. The main problem in Type 2 diabetes mellitus is that the body becomes resistant to insulin. Since the cells of the body need insulin in order to absorb sugar, insulin resistance leads to low amounts of sugar in the cells and increased levels of sugar in the blood (hence the name “sugar diabetes”). The flavinoid molecules in chocolate may reduce insulin sensitivity. In other words, dark chocolate and cocoa has chemicals within it that can delay or improve diabetes. 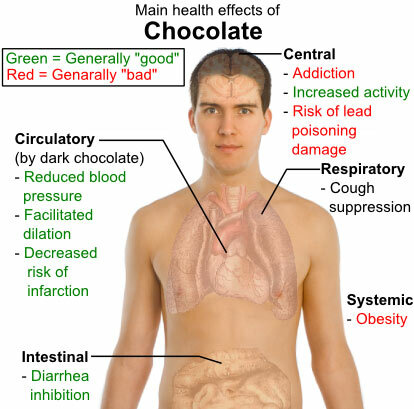 It is very important to realize that while certain chemicals naturally found in chocolate can lead to health benefits, it remains to be seen how big of an impact a moderate amount of chocolate has on these diseases. It is also important to keep in mind that while chocolate has plenty of chemicals that are heart healthy, they also pack a high concentration of calories. While a few ounces of chocolate may have the same amount of antioxidants as a cup of green tea, the tea (without milk or sugar) has no calories at all. Thus when one overindulges in chocolate, the body will convert the unused sugar and fat in the chocolate in fat on the body. And obesity increases cholesterol levels and obesity is an important, independent risk factor for cardiovascular disease. First, chocolate is not inherently evil. When eaten in moderation, chocolate can be part of a heart healthy and even a cholesterol lowering diet. Second, the darker the chocolate, the healthier it is—provided that the plant sterols and flavnoid molecules have not been modified too much. Natural occurring cocoa and dark chocolate are best because they have the highest concentration of antioxidant compounds. Third, too much of a good thing is a bad thing. Overeating chocolate leads to obesity, which counteracts the benefits of all of those antioxidants that may be in the chocolate. Dark chocolate can and should be used to replace high carbohydrate (sugary, low-fat) snacks, but neither should be eaten in excess. As part of a balanced diet, chocolate can be a tasty, satisfying, and heart healthy snack! Allen RR, Carson L, Kwik-Uribe C, Evans EM, Erdman JW Jr. (2008) Daily consumption of a dark chocolate containing flavanols and added sterol esters affects cardiovascular risk factors in a normotensive population with elevated cholesterol. J Nutr 138(4):725-31. Bonanome A, Grundy S. (1988) Effect of dietary stearic acid on plasma cholesterol and lipoprotein levels. N Engl J Med 318:1244-8. Grassi D, Necozione S, Lippi C, et al. (2005) Cocoa reduces blood pressure and insulin resistance and improves endothelium-dependent vasodilation in hypertensives. Hypertension 46(2):398-405. Kris-Etherton PM, Derr JA, Mustad VA, Seligson FH, Pearson TA (1994) Effects of a milk chocolate bar per day substituted for a high-carbohydrate snack in young men on an NCEP/AHA Step 1 Diet. Am J Clin Nutr 60(6 Suppl):1037S-1042S. Kris-Etherton PM, Mustad VA. (1994) Chocolate feeding studies: a novel approach for evaluating the plasma lipid effects of stearic acid. Am J Clin Nutr 60(6 Suppl):1029S-1036S. Tholstrup I, Marckmann P. Jespersen J, Sandstrom B. (1994) Fat high in stearic acid favorably affects blood lipids and factor VII coagulant activity in comparison with fats high in palmitic acid or high in myristic and lauric acids. Am J Clin Nutr 59:371-7. Tholstrup I, Marckmann P. Jespersen J, Vessby B, Jail A, Sandstrom B. (1994) Effect on blood lipids, coagulation, and fibrinolysis of a fat high in myristic acid and a fat high in palmitic acid. Am J Clin Nutr 60:919-25. Written by Michael T. Sapko M.D., Ph.D., and edited by Donald Urquhart.